Funeral services for Ruby Eleanor Ella Rumph, 88, will be held Wednesday, December 5, 2018 At 3 PM at Dyches Funeral Home Chapel with Rev. Billy Hill and Chaplain Dexter Lambert officiating. Burial will follow in the Williston Cemetery. Visitation will be one hour prior to service. Ruby died at her home surrounded by loving family on Sunday, December 2, 2018. Ruby was born in Grover, S.C. June 9, 1930, the daughter of Luther Jesse and Mayna Lee Avant. 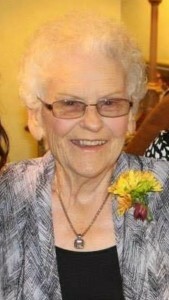 Ruby graduated from St. George High School in 1948. She married Herman Earl Rumph, on February 20, 1951, in Charleston S.C., days before he left for the Korean War. They settled in Williston, S.C. in 1952 and resided there for the rest of their lives. She was a devoted wife, mother, grandmother, and great-grandmother. Ruby was a Charter Member of Winfield Heights Baptist Church. She is survived by a son Michael (Sandy) Rumph of Greenville, S.C., Beverly (Danny) Mundy of Gaston S.C., and Joy (Bryan) Lindell of Aiken, S.C. Five grandchildren, Jennifer (Matt) Mole, Lexington S.C., Dylan Rumph, Charleston, S.C., Linda Rumph, Greenville, S.C., Derek (Taylor) Dyches, Williston, S.C., and Bryana Dyches, Charlotte, N.C. Two great-grand children Ava Mole and Cayden Dyches. One sister, Taddie Ruth Anderson, Deland, Florida. She was predeceased by her husband of sixty-five years, Herman Rumph and ten brothers and sister. Pallbearers will be Luther “Bobo” Avant, Derek Dyches, Dylan Rumph, Danny Mundy, Bryan Lindell, Lonnie Dyches, Matt Mole, and Honorary Pallbearer Buck Daniel. The family would like to thank the special care of Trinity Hospice and Circle of Life Hospice. The family has entrusted Dyches Funeral Home and Crematory with the arrangements.